Yes, I would like to play this. Er, but I’ll pass on this one. 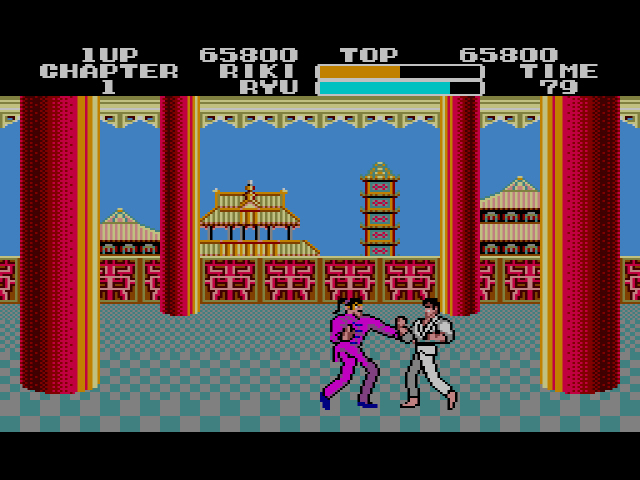 Black Belt is otherwise known as Sega’s response to Nintendo/Irem’s Kung Fu for NES. Both games are early beat-em-ups that center around stereotypical martial artists plowing through waves of stereotypical Asian enemies that don’t know when to say when. 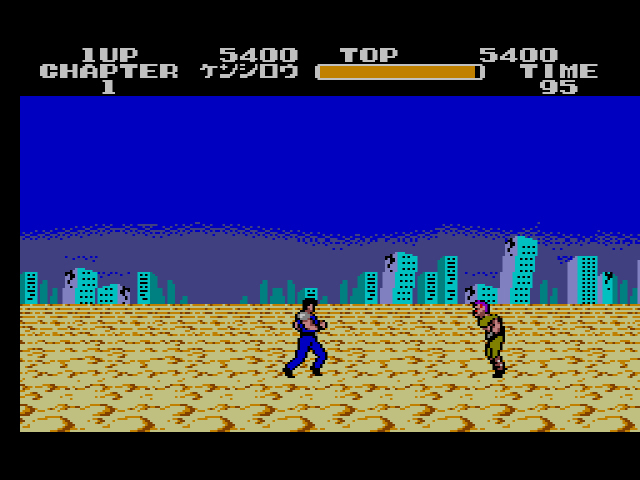 Both games started out with different titles and protagonists, but contained the same side-scrolling beat-em-up action: Kung Fu was originally Spartan X, a tie-in for a Jackie Chan film, while Black Belt was called Hokuto no Ken or “Fist of the North Star,” based on the anime’ of the same name. What separates Irem’s creation from Sega’s, then? 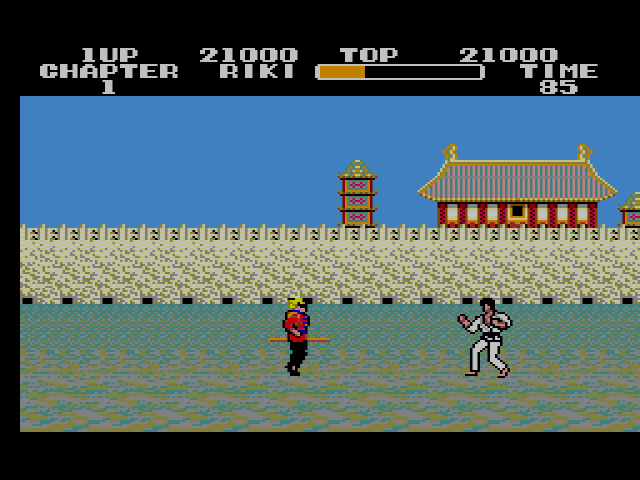 Kung Fu is light and fast-paced, as if it was meant to be beaten quickly (given its original arcade status, it probably was). Black Belt, however, is more methodical and forces you to consider how you attack the absurd amount of mid-bosses and bosses the game throws at you. 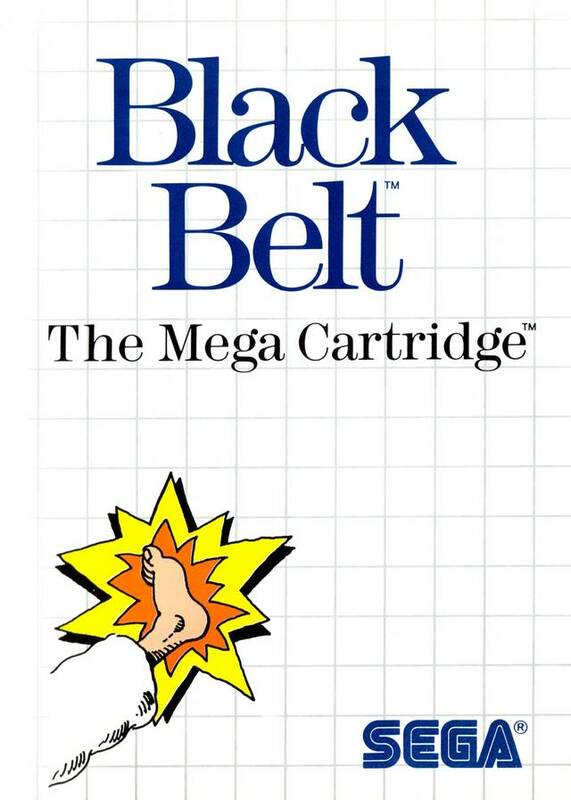 I personally prefer the straightforward action of Kung Fu, but for an early console-only beat-em-up, Black Belt has a surprising amount of moxie. One and the same, give or take about 1,000 awesome points. Black Belt begins like any other beat-em-up: men without shirts come at you, you kick/punch them away, they break apart into tiny chunks. This fist/foot connection continues until you come to your first mid-boss, an axe-thrower who doesn’t want to die after one punch (how selfish). Avoid his axes, hit him four times, he explodes, and you get some bonus points. More shirtless men run towards you, you kick them, then the next mid-boss, a staff-wielding dynamo. This back-and-forth continues until you’ve felled four mid-bosses, each with specific attacks and weak points. Then, as if four mid-bosses wasn’t enough, the end boss appears. He’s a dandy named Ryu, and you can’t hit him unless he’s in the middle of an attack; when he’s just moving around, your attacks go right through him. His attacks have greater range than yours and are stronger than yours by at least a two-to-one margin. He’s one of the hardest beat-em-up bosses I’ve ever faced, and he’s only the first main boss out of six on Black Belt (never mind the mid-bosses you’ve yet to face in future levels). After about eight times or so, I gave up without beating Ryu. Call me a quitter who just wants to go home and be a family man, but nobody deserves that much frustration. Traditional Asian setting is fine, but apocalyptic landscape is finer. Which is a shame ’cause Black Belt has potential of sorts. While the stages are full of the same repetitive punch/kick nonsense critics of the beat-em-up genre hate, the mid-bosses inject the game with much-needed strategy and timing. If you don’t analyze the mid-bosses’ attack patterns and react accordingly, you risk destroying yourself. On the flip side, though, even if you flail your limbs akimbo, you’re bound to hit them a couple times. The main bosses, however, require Super Saiyan levels of skill and patience. There’s Ryu, who I already mentioned, then Gonta, the Sumo Master who will decimate your life bar by jumping on you, and Oni, a Ninjitsu Master who will duck at every attack you throw at him. The only way to hit him? Punch his mask while he’s attacking you. No thanks. Black belts should be achieved through hard work and gumption, not cheap hits. Riki, please lose that number. I love Fist of the North Star! The game does look pretty frustrating, though. Too bad it’s not a better beat ’em up. The source material is so awesome! Great review! Thanks Gino! Yeah, Fist of the North Star rules! Ah, Fist of the North Star. The classic franchise where people get punched and explode into bloody chunks. Good clean family fun! I gotta disagree on this one. It’s by no means my favorite SMS game. I definetly enjoyed this.But his game fits into the old school hard kind of games that relys on learning a pattern, but once you learn the enemy’s tells its not nearly as hard as this review makes it sound. It’s meant to be played repeatedly until you discover each bosses weakness and exploit it. Once you learn all the bosses patterns it’s not very hard at all. I don’t believe you couldn’t get past the first boss. This is one of the games that sold me on a SMS. Especially the boss fights were the screen switches to to huge sprites for fighting.It just looked amazing at the time. And the skill made it a satisfying challenge. I would talk to friends at school to discover strategys for beating the bosses. I had a lot of fun with this one. And some of the bosses I believe you had to finish off with a punch OR a kick or they would not die. 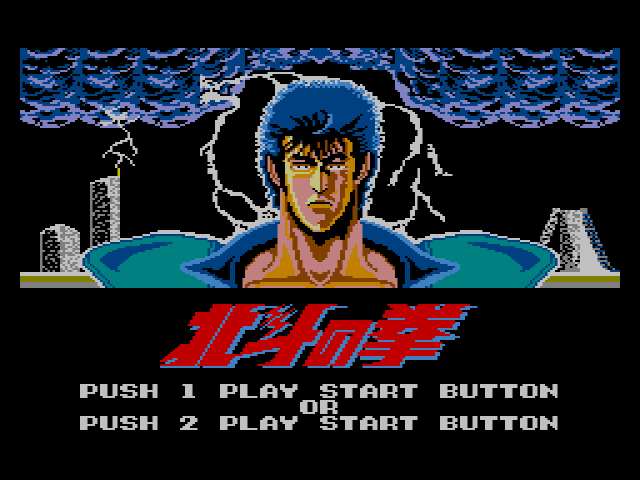 Which then delivered the classic Fist of the North star flurry of finishing punches before exploding your enemy. 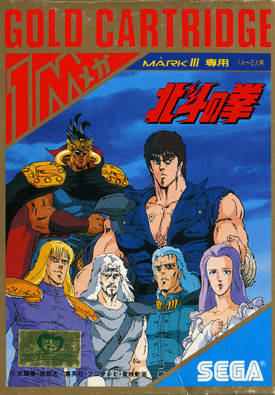 I didn’t know what Fist of the North Star was when this came out, but when it was finally released as an early anime movie a few years later I instantly remembered this game and wondered if it was related. (Which was confirmed years later.) I would have loved to play the original Japanese liscenesed version of this game. Sega would do this again on the Mega Drive with Last Battle which was also Fist of the North Star, although more recognizably so. For anyone interested here is a good long play of the game. Notice the first boss the last sliver of health doesn’t go down with kicks. He doesn’t die until you land a punch. Also I really loved the 5 th stage boss fight in the room with the fireplace with weapons on the wall. I figured out the first guy’s pattern or so I thought. I’d get him down to about 1/3 life, then he’d change his patterns up a bit. And his hits take more off than yours do, so I’d always end up dying. Admittedly, I didn’t know about having to finish them off with a punch or kick. I feel comfortable with this score. The four user reviews over on GameFAQS seem to be a good barometer for how people feel about this game: 7, 2, 8, and 3 out of a 10 point scale. Two enjoy the game, two hate it. I don’t hate the game, but not being able to get past the first boss after fighting him numerous times really wears on me. Like I said, I’m not a bad player. I have extensive experience with difficult beat-em-ups and side-scrollers. I guess Black Belt just really hates me. To be fair I can’t think of a game that really plays like Blck Belt. You hit on it a bit with the Kung Fu bit. But the main bosses don’t really play like that game. I guess harder is one way to describe it. Or you could say it is challenging and involved. When you get to last battle, you’ll see something similar, but I think it’s a little more refined there. But still frustrating. It’s also possible I had more patience for this type of thing as a kid. I remember it taking me weeks to advance past a boss till I figured it out. Which sounds kind of brutal nowadays thinking about it. Hate to revist this thread again, but I was just looking at a list of Fist of the North Star games, and I found out they had a Sega Ages remake of this game on PS2. 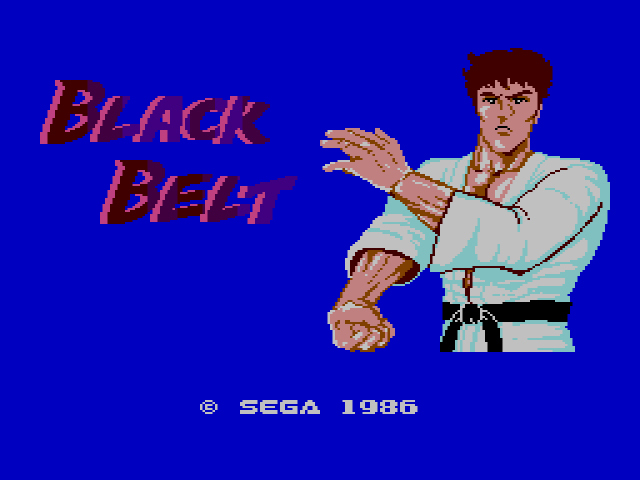 I would love to own all of those Sega Ages titles, even ones with 3D remakes of Black Belt.